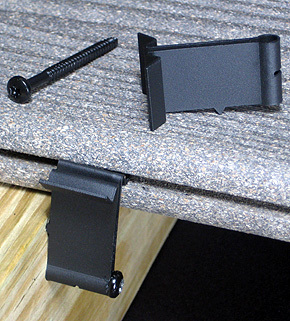 The Most Versatile Hidden Deck Clip! 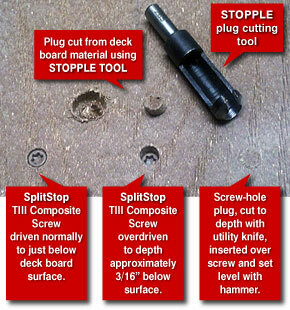 A Simple, Economical, Versatile and Lifetime Warranted Solution to Hidden Deck Fastening. Larger clip applies to side of joist and is easier to handle. Installs from the top-side of deck. Can be bent to facilitate easier board placement on installed clip. Requires no special aligning of multiple pieces. No framing blocks are needed to join boards end-to-end. Economical Nearly half the price of stainless steel hidden fasteners. Includes screws, drive bit, instructions and plastic pail. Versatile Fits grooved boards of 3/4” to 1 1/2” thick regardless of groove location. Fits 1/8” to 3/16” size groove widths. Can be used with wood or composite decking. Allows for multiple spacing distances and for product expansion. Lifetime Warranted Features the same Lifetime Warranty as SplitStop ACQ Rated Screws. Make your own plugs on the job-site and save. Match any color decking.